The Hubble Space Telescope was launched in 1990 and was serviced by astronauts on board the Space Shuttle five times. This talk will focus on the final Hubble Space Telescope Servicing Mission, STS-125, which took place in May, 2009 on-board Space Shuttle Atlantis. During that mission the crew upgraded the telescope through a series of five spacewalks, setting a record for space walking time on a single space shuttle mission. The spacewalks included the first ever repair in place of Hubble science instruments. Mike Massimino completed his B.S. degree from Columbia University, after which he worked for IBM as a systems engineer in New York City. In 1986 he entered graduate school at the Massachusetts Institute of Technology where he conducted research on human operator control of space robotics systems, which resulted in the awarding of two patents. After graduating from MIT in 1992, Mike worked at McDonnell Douglas Aerospace in Houston as a research engineer where he developed laptop computer displays to assist operators of the Space Shuttle remote manipulator system. 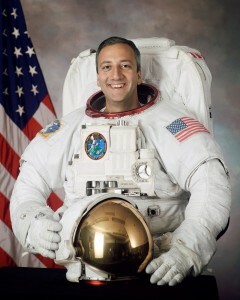 Mike was selected as an astronaut candidate by NASA in1996. After two years of initial training he qualified for flight assignment as a mission specialist. Prior to his first space flight assignment, Mike served in the Astronaut Office Robotics Branch, and in the Astronaut Office Extravehicular Activity Branch. In 2002, following his first spaceflight, Mike served as a spacecraft communicator in Mission Control and as the Astronaut Office Technical Liaison to the Johnson Space Center EVA Program Office. A veteran of two space flights, Massimino has logged a total of 571 hours and 47 minutes in space, and a total of 30 hours and 4 minutes in four spacewalks. He was a member of the the crew that successfully refurbished the Hubble Space Telescope which now has four new or rejuvenated scientific instruments, new batteries, new gyroscopes, and a new computer. Massimino is currently an adjunct professor at Rice University and at Georgia Tech. He has published papers in technical journals and in the proceedings of technical conferences. Recently he served as the inaugural executive director of the Rice Space Institute.